Jupiter Is Going to Be Super Big & Bright Tonight. Here's How To See It. Just days after the peak of the Eta Aquarid meteor shower and a rare chance to see the Northern Lights in parts of the United States, another spectacular celestial phenomena is about to light up the night sky. Jupiter, our solar system's largest and most mysterious planet, will appear at its biggest and brightest of the year on Tuesday night -- so big and bright that you don't even need a telescope to see it. All you have to do is look up. Jupiter will be in "opposition," or exactly opposite the sun in our sky. The swirling gas giant will rise in our sky just as the sun sets (around 7:59pm on the East Coast) before it reaches its highest point in the sky around midnight. Weather permitting, you'll be able to see it clearly with the naked eye, a simple set of binoculars, or even a small telescope if you've got one. In other words, Jupiter may be around 365 million miles away (at its nearest) from Earth, but it's ready for a bit of a closeup. So, uh, try not to miss it. How to see Jupiter in "opposition"
If the weather is clear enough in your area, it'll be more than easy to see Jupiter at its most brilliant. Best of all, you'll have lots of time -- all the way from sunset on Tuesday (7:59pm on the East Coast) to sunrise on Wednesday (5:58am on the East Coast) -- to get outside, get situated, and enjoy the view. However, the best time to look will be a few hours after sunset, when the sky will be much darker, according to a report by Space.com. Jupiter will be the brightest object in the sky when it rises in the East, so you'll have no trouble spotting it without equipment. Binoculars may help you hone in on the planet, but a small telescope will allow you to see stunning details such as its four moons -- Callisto, Europa, Ganymede, and Io -- and even the planet's swirling clouds of gasses. Equipment aside, getting away from city light pollution to some place super dark will improve your view. Be sure to check your local weather forecast and consult tools like EarthSky before you venture out. 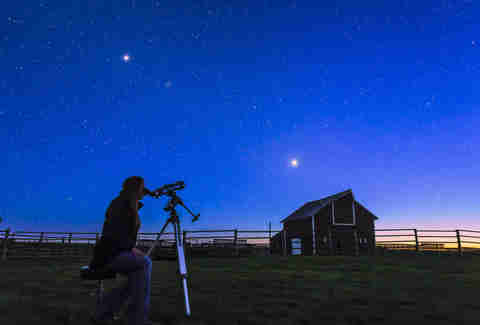 Most parts of the US will have fair to good viewing conditions, but storms in parts of the Pacific Northwest and the Midwest will likely ruin chances of seeing Jupiter at its best, according to a report by AccuWeather. What does it mean when Jupiter is in "opposition"? The event is just as simple as it sounds. When a planet or an object is in "opposition," it's exactly opposite the sun in the sky from the vantage point of Earth. This means the planet (in this case Jupiter) will rise in the sky just as the sun sets, or vice versa (in some cases), according to Space.com. In other words, Earth will be directly between Jupiter and the sun. 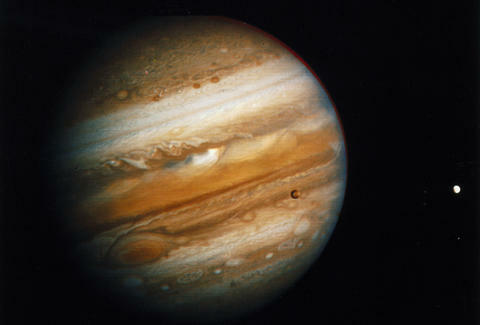 Jupiter's opposition happens about every 13 months, according to a report by EarthSky. "The reason is that the orbits of Earth and Jupiter aren’t perfect circles, and, moreover, their orbits aren’t exactly on the same exact plane," per the report. "They’re both very nearly circular, and go around the sun on almost the same plane, but not quite. Jupiter’s distance from the sun varies by only about 10.1% between perihelion (closest point to sun) and aphelion (most distant point from sun)." If both Earth's and Jupiter's orbits were perfect circles, Jupiter's closest approach to Earth would fall on the same day as its opposition. But, alas, even space isn't perfect. When's the next time Jupiter is in "opposition"? If you miss out on seeing Jupiter's opposition on Tuesday, you'll have to wait for a little more than a year before it's as big and bright again. The next time it'll happen is June 10, 2019, per EarthSky. The last time it happened was April 7, 2017. So, while it's certainly not a rare space event like, say, a total solar eclipse, it's certainly worth taking the time to see it if you can. At the very least, you should step outside and look up before you call it a night. Tony Merevick is Senior News Editor at Thrillist and wishes he had a telescope right about now. Send news tips to news@thrillist.com and follow him on Twitter @tonymerevick.